It goes without saying that wood, rock or concrete bulkheads built along the shoreline are not natural. They certainly don’t look like any structure formed by nature. And when the water is pushing up against them, waves bounce around and splash back instead of rolling up on shore. I have never had any trouble understanding some of the problems caused by bulkheads. I imagine little juvenile salmon swimming along the shoreline, working their way toward the ocean. In shallow water, these little fish can stay away from the bigger fish that want to eat them. But bulkheads create a stretch of deeper water, where predatory fish can swim in close and devour the little ones. I’ve been told that bulkheads cause other problems as well, such as blocking shoreline erosion. But isn’t that what they are designed to do? What’s the problem? As I’ve learned — especially over the past few months — natural erosion provides the sands and gravels needed for healthy beaches. Natural beaches also collect driftwood, which provides additional habitat for a variety of creatures. As many readers know, I now work half-time for the Puget Sound Institute, a University of Washington affiliate that publishes the Encyclopedia of Puget Sound. We’ve been working on a series of articles about bulkheads — formally known as shoreline armoring — and I’m more convinced than ever that bulkheads really do cause problems. As sea levels continue to rise, the high-tide and low-tide lines move to higher elevations on the beach — until the high-tide line reaches the bulkhead. For many bulkheads, the high-tide line is already there. At that point, the rising sea level continues to push the low-tide line to higher and higher elevations, reducing the spawning habitat for fish that lay their eggs in the intertidal area. 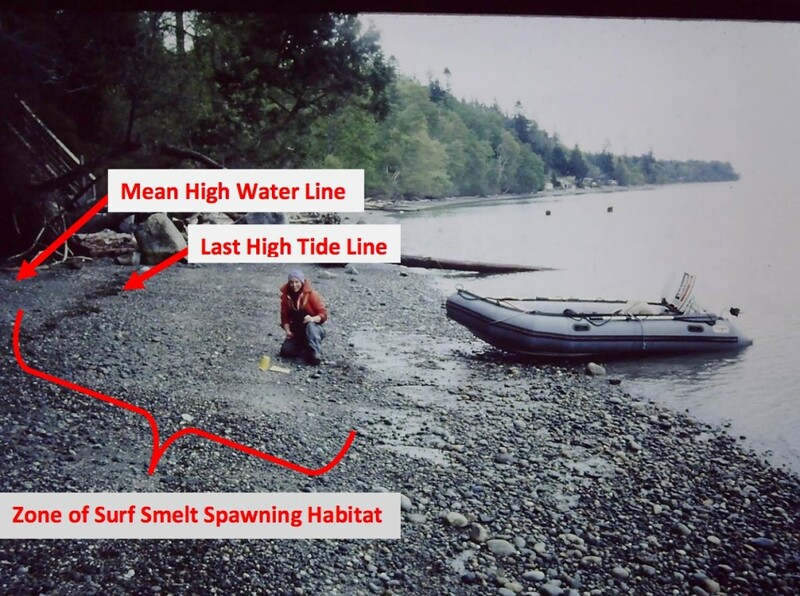 This shrinking habitat is known as “coastal squeeze” or “beach squeeze.” Recent studies suggest that where bulkheads are located, Puget Sound could lose 80 percent of this spawning habitat by the turn of the century, based on average predictions of sea-level rise. On beaches without bulkheads, the high-tide line would move steadily inland, helping to maintain the critical habitat for forage fish, according to Timothy Quinn, chief scientist for the Washington Department of Fish and Wildlife. It turns out that many bulkheads constructed through the years were never needed to prevent erosion, because they were built to protect homes in areas where erosion is minimal. Future stories in our series will cover this issue, including the prospect of removing existing bulkheads to improve shoreline habitats. Unfortunately, sea level rise adds a new twist to the discussion. Still, the best advice when building a new house is to keep the structure back from the water’s edge. Meanwhile, this initial installment of the Shoreline Armoring Series includes a nice piece by science writer Eric Scigliano called “Shoreline armoring’s effect on the food web.” In this story, Eric looks at a broad spectrum of effects caused by bulkheads. 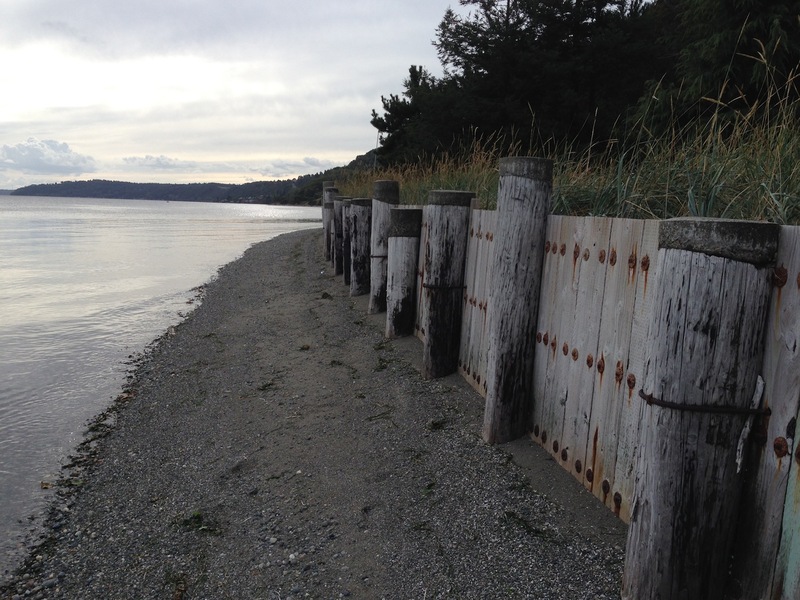 He reports on an involved study that focused on a series of paired beaches — one with a bulkhead and one without — located in various parts of Puget Sound. Most of the studies that we will report on during this series were funded by the Environmental Protection Agency through grants coordinated by the Washington Department of Fish and Wildlife. The plan is to release about two additional stories each week over the next two weeks. Thank you for the good article that explains well many of the impacts of bulkheads. A small addition related to your idea that there are no natural structures that look like bulkheads and seawalls. There are actually many miles of natural deepwater rocky shoreline along the inland waters from Puget Sound to Alaska that look and impact water and wave action like a rock or concrete bulkhead. However I don’t at all claim that these steep rocky shorelines excuse the construction of unnecessary bulkheads, in fact the long stretches of shear rock make the rarer small beaches and estuaries in those areas all that much more important as habitat and in need of protection. I agree with almost everything you say, and I hesitated before writing that bulkheads don’t look like any natural structure I’ve seen. But, in truth, I can’t think of any rocky shoreline that looks like a bulkhead. In terms of function, many rocky shorelines act like bulkheads, with limited erosion and lots of wave action. I think that’s what you’re getting at.